Cost-effective laser projection with excellent picture quality, easy installation and low running costs The VPL-PHZ10 laser projector is a versatile, affordable choice for installation in a wide range of education, business, and entertainment environments. The powerful Z-Phosphor laser light source is teamed with Sony's advanced BrightEra 3LCD projection engine to deliver extremely bright, detail-packed WUXGA-resolution images with a generous 5,000 lumens** of brightness and rich, stable colors. This laser light source allows up to 20,000 hours* of virtually zero-maintenance operation without the worry of sudden lamp failures. An automated filter system cuts the hassle of regular dust cleaning. Near-zero maintenance needs are complemented by a range of energy-saving features, significantly driving down total lifetime ownership costs. Constant Bright maintains consistent light output levels throughout the laser's 20,000 hours (at light output mode ""Middle"") recommended lifespan. Offering a stylish blend-in design and low fan noise, the VPL-PHZ10 fits smoothly into almost any environment — from academic institutions to corporate environments. Mount the projector at any angle, even on its side or upside down. Setup is easier than ever with a friendly new installation menu. *Actual hours may vary depending on usage environment. **The new projectors have a total constant brightness of 4500 lumens for up to 14,000 hours depending on usage environment. 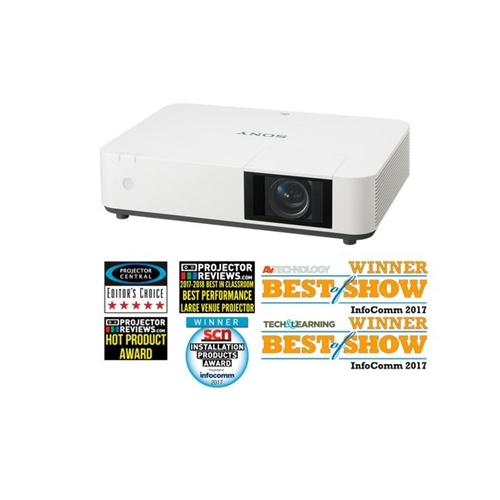 This enables users to experience the projectors’ original level of image quality for years, while achieving a maximum 5,000 lumens brightness when the constant brightness mode is off. Very high image quality with Sony's advanced BrightEra 3LCD projection engine and Z-Phosphor laser light source. See fine detail in PC presentations, videos, or multimedia signage with WUXGA (1920 x 1200) 16:10 resolution.